Please check the size fits prior to ordering. This product consists of 3 lines of text in a single colour as shown in the image. 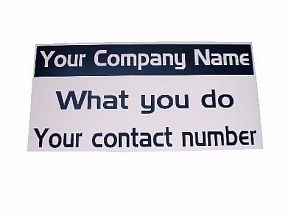 Magnetic signs are very useful where signs need to be added and removed on numerous occasions, i.e. taxi cabs, vans with different uses, lorries, steel shelving, filing cabinets and anything else with a steel surface. All magnetic signage supplied by us are safe to use on motorways when mounted in the correct way. Important Information regarding this product. Note: This is a special offer product and the price is for two identical signs. Magnetic signs will only stick to steel surfaces, please check your vehicle panels are steel prior to ordering. Enter your 3 lines of text and colour during the checkout.